The Chicago El has warming stations on the platforms. 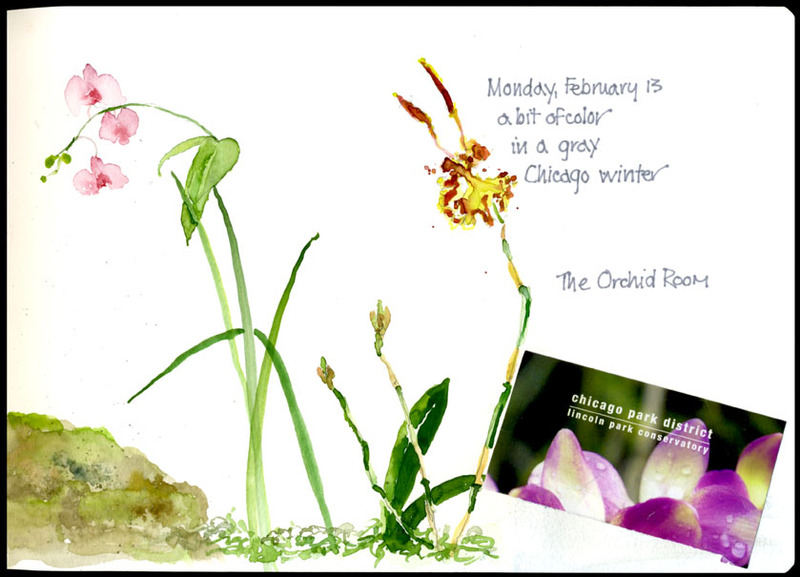 They make me feel like a fast food French fry but when that winter wind blows I'm glad they're there! This is about a "three trains gone by" sketch. 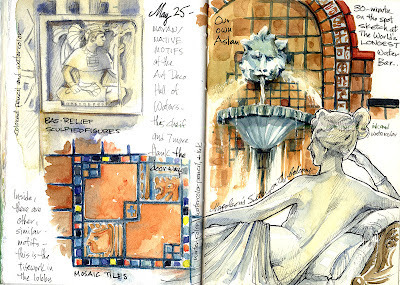 I've been using the large Moleskine watercolor book for Monday sketching. At about 8 x 11 it's a bit of a pain to lug around but since I'm trying to push out of my comfort zone and work bigger – you do what you gotta do! Granite City is an industrial town. At its center are steel mills, ore & coke processing furnaces and railroad tracks that bustle with freight trains through the town around the clock. Recently the largest mill in the city, USS steel resumed production. Good news for recalled workers yet idle and seemingly abandoned facilities remain. 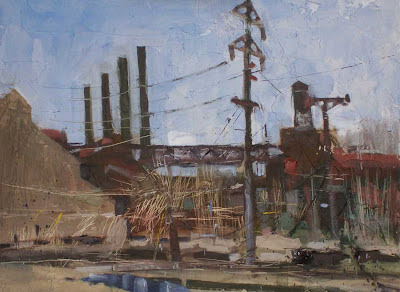 I painted this oil sketch on a paint out with Missouri Plein Air Painters Association last Sunday morning. Idle Mill, Michael Anderson, oil on canvas board, 12" x 16", 2012. 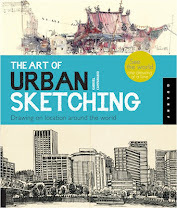 Here's our founder, Gabi Campanario, talking about urban sketching and the book, on TV! 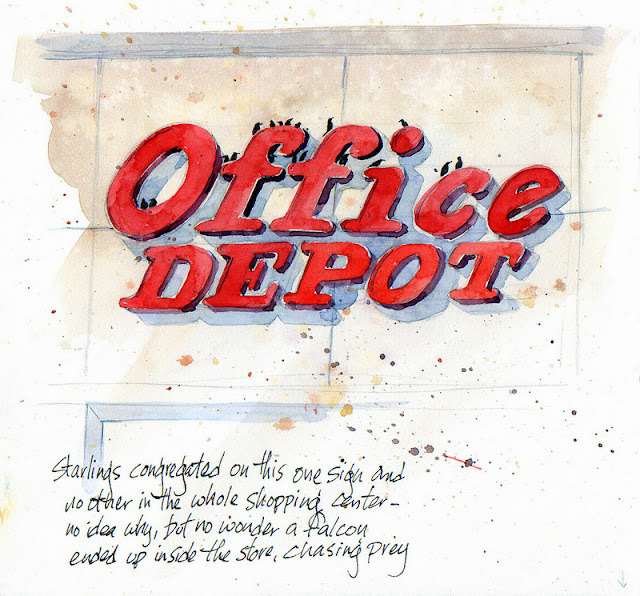 The other day when we went looking for printer paper, I noticed that starlings were perched all OVER the Office Depot sign...and not another sign in the whole blocks-long shopping center. I told Joseph to shop without me, I wanted to SKETCH!! 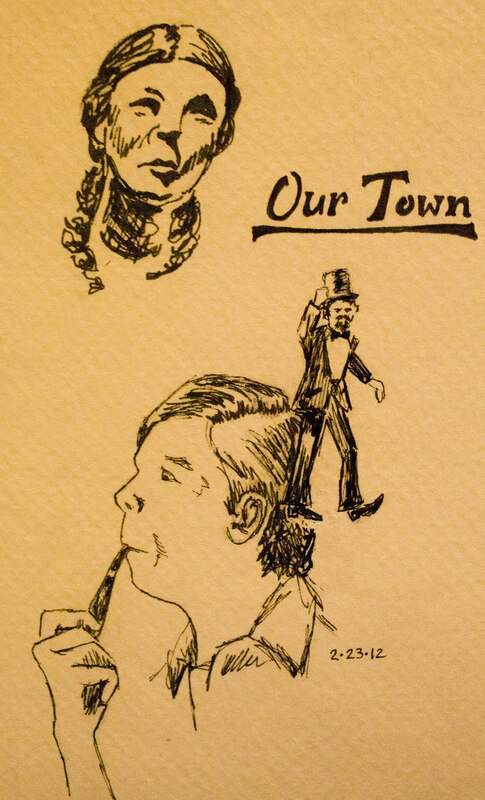 My son is in the high school's production of Our Town this weekend. Last night was family night and I was able to do some quick pencil sketches in the dark and then add ink once I had light. (Baby steps, I'm not ready to put down ink in the dark.) My son is the dapper gentleman wearing the top hat. It was Diana's first time with us...and we were really glad she came! Not only were she and husband Tim a lot of fun, but she loaned me her camera since I'd gone off without mine! John liked the possibilities at the lobby, too! 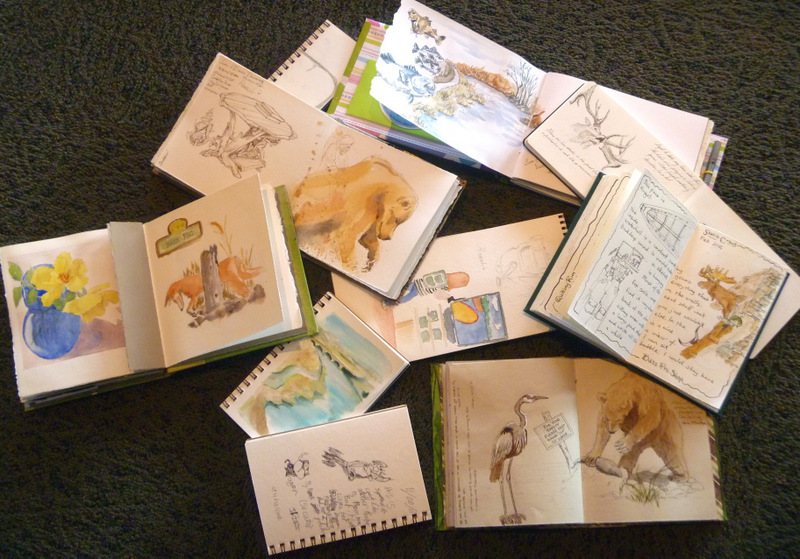 And here's one of her journal pages...those mounts make it easier to draw wildlife close up, and the busy public setting makes it a challenge all on its own. And here are our two youngest members, Malinda's terrific kids! Rianna was perched across the pool sketching, and Geordan settled in beside me...everyone was completely unselfconscious and enjoying the day! We met at The Bass Pro Shop in Independence. 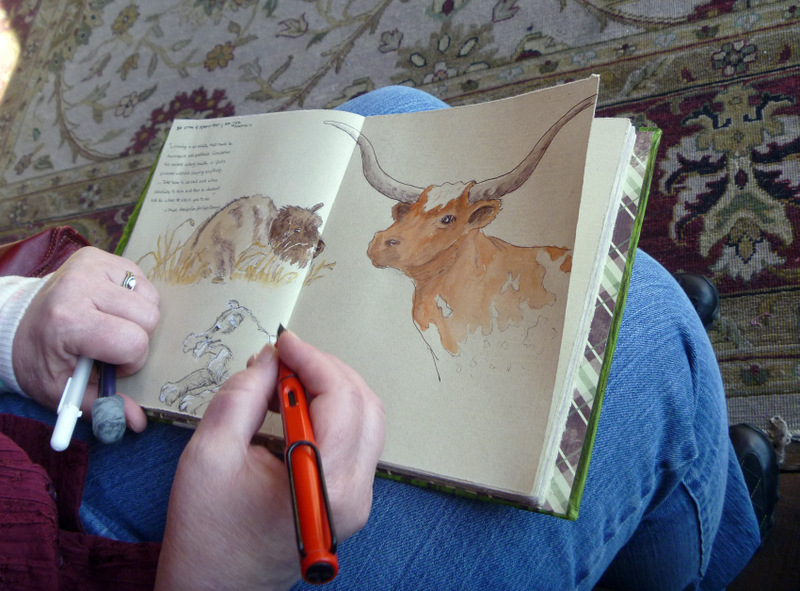 As soon as I entered the foyer area, I just had to sketch the Texas longhorn since our children all live there . . . . then I added a baby bison for our home, Kansas. It's so easy to draw animals that don't keep moving! The foyer was a very inviting place to start out, with deep couches, a huge ottoman, and huge live fireplace. This awesome grizzly bear was next to a pond with living fish and ducks . . . . which attracted lots of parents and grandparents with small children, some of the youngest ready to jump right in. As we drew, some of us found that we were part of the day's entertainment. A few of us even had our pictures taken by shoppers as we sketched. I thought that would make me feel intimidated, but it was actually lots of fun. Strangers are generally very respectful and admiring. Eating at the restaurant later, we passed our sketchbooks around, signing each other's books to remember the day. 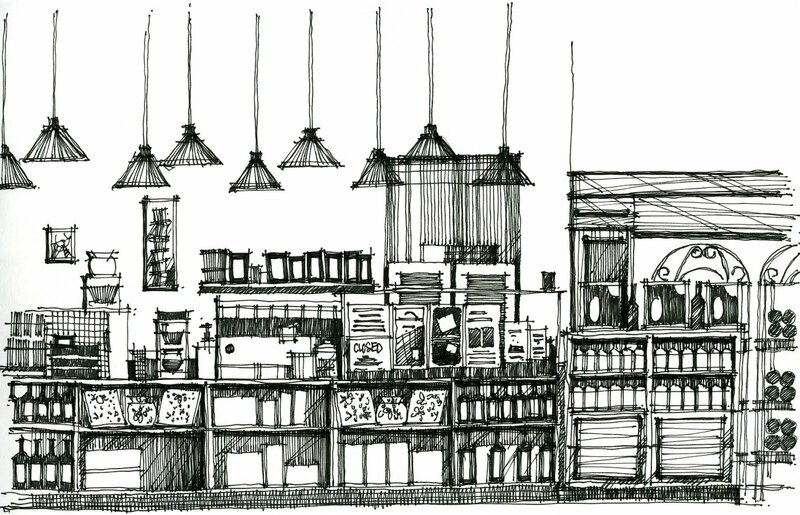 Shops like this are a fantastic place to find subjects for sketching. Besides the animals, there was a great antique truck (Jeanette captured it! ), a lovely view overlooking a small lake and running trail out the huge windows, lodge-style furnishings, and so many interesting people of all ages! Way too much to capture in a few hours. 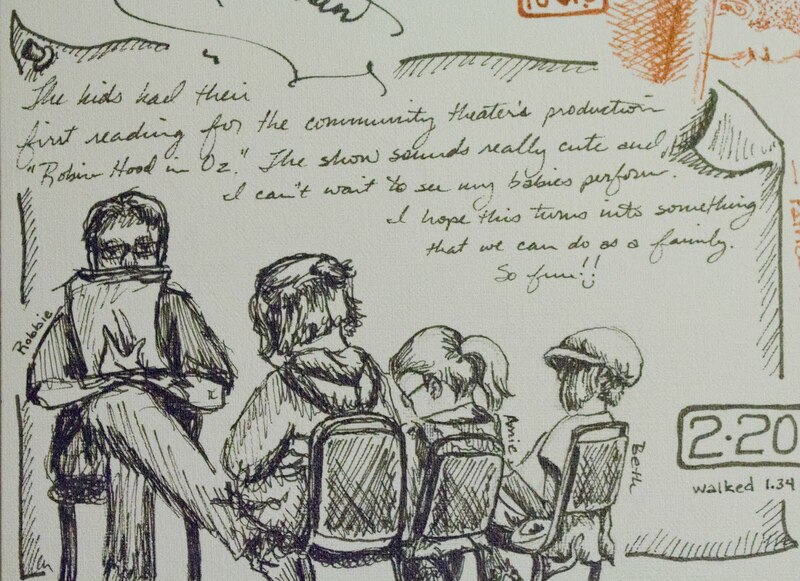 This just in on our parent blog, Urban Sketchers...a fabulous lineup again this year, in a wonderful spot. I can't go, but I hope some of you can! (By URBAN SKETCHERS. 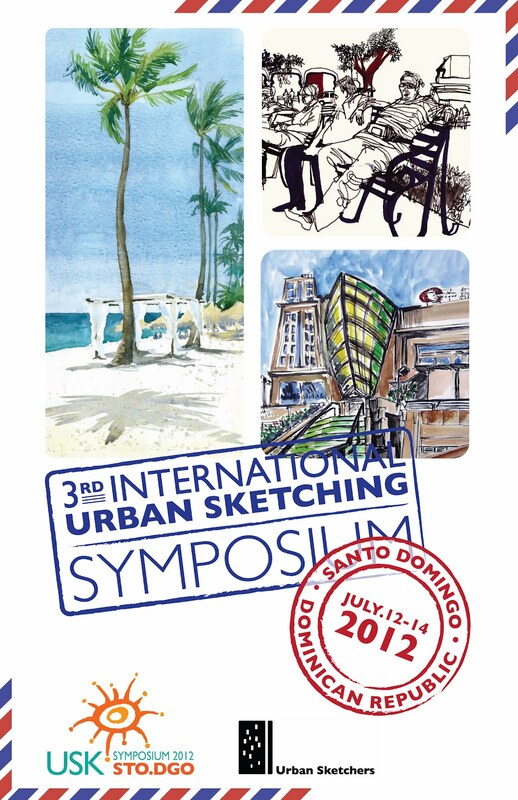 Feb. 20, 2012) — The Dominican capital of Santo Domingo is the host city of the 3rd International Urban Sketching Symposium July 12-14, 2012. 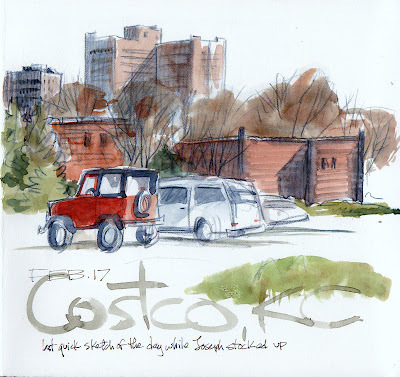 This three-day event is organized by Urban Sketchers, a nonprofit organization dedicated to fostering the art of on-location drawing. More than 100 local and international sketching enthusiasts will gather in Santo Domingo to capture the city's people and architecture with their drawings. At the heart of the three-day conference are 40 hands-on sketching workshops around Santo Domingo’s Colonial Zone, panels and lectures that will take place at Centro Cultural de España (CCE), and a closing reception at Museo de las Casas Reales. The Center and the Museum are centrally located in Santo Domingo’s Colonial District, within walking distance of scenic city landmarks such as Santa María Cathedral, the first in América; Alcazar de Colón (Columbus Palace); the National Pantheon; the Fortress of Santo Domingo, known as Ozama Fortress; ruins of the Monastery of San Francisco; and many more monuments from the 1500's. About Santo Domingo, Domínguez says the city is perfect for this type of event. “In the Colonial Zone, participants will have the opportunity to sketch the welcoming locals playing dominoes or dancing Merengue, plus some of the oldest historic landmarks in the Americas since the arrival of Columbus,” said Domínguez. For Marie Christine Compane, a French sketcher who participated in the Lisbon Symposium, the event was a great occasion to meet other people fond of drawing, while learning from the sketching workshops. “In the ‘Contrast’ workshop we learned to sketch with strong colors and values in Lisbon's colorful little streets: pink, yellow, green, purple were really there. The atmosphere was really motivating, fun and full of gentle smiles,” said Compane. 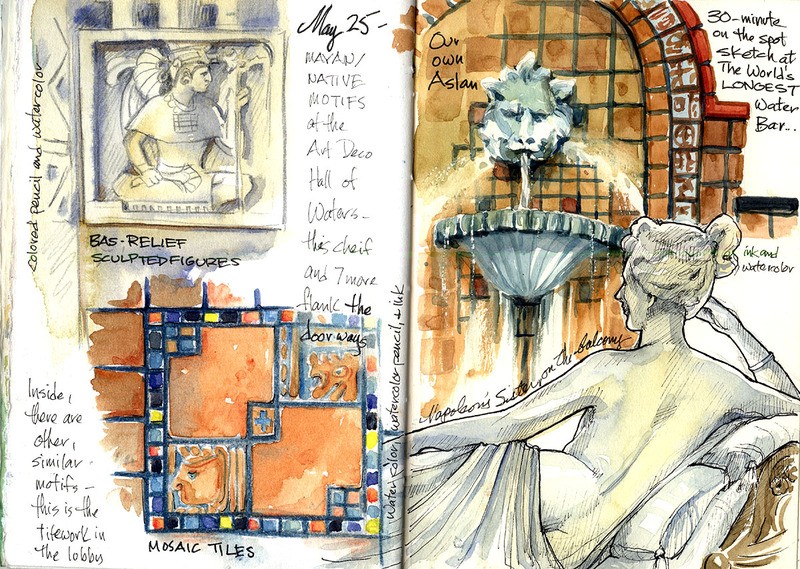 Urban Sketchers is a 501(c)3 nonprofit organization dedicated to raising the artistic, storytelling and educational value of location drawing, promoting its practice and connecting people around the world who draw on location where they live and travel. 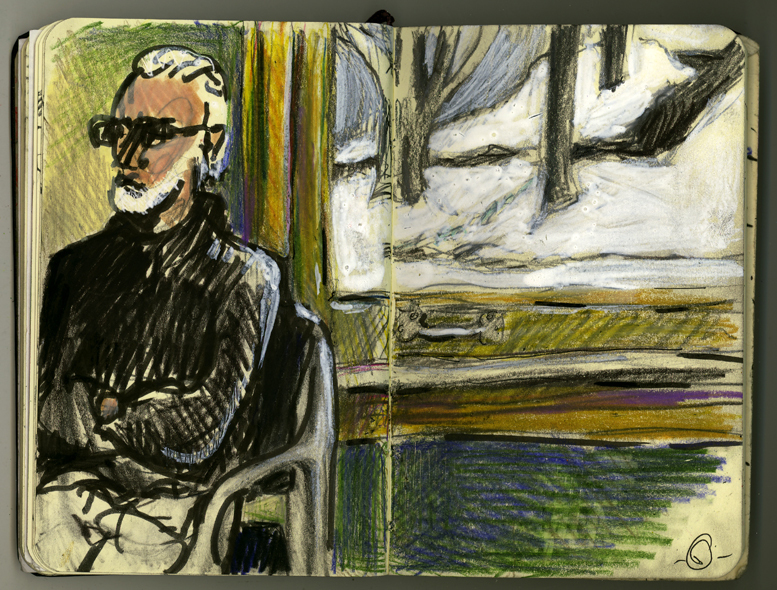 I was dying for some outdoor sketching a week or so ago, and then my scanner went on strike...so I shot these with the camera instead. This is an amazing building, which architects from all over the world have come to explore. Hundreds of visitors and spa patients came here till the 1950s--it's one reason our town has such wide sidewalks, to accommodate the crowds! Groundbreaking for the building took place in 1936, in the height of the Great Depression, and it's STILL a draw. It houses our city offices and cultural museum, now. Here are some of the interior details from a sketch I did several years ago...the bronze doors on the elevators pick up the motif at upper left. And yep, the statue is NOT Mayan, it's Napoleon Bonaparte's sister-in-law, as I remember...how she came to reside here, I don't remember. It was a chilly, sunny day so I sat in my car and took advantage of solar heat pouring in the windows, only occasionally starting the car to warm my feet. 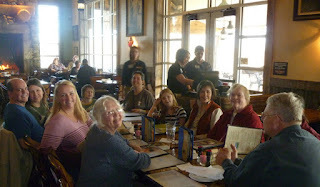 Our regular sketchcrawl group met yesterday, as Christiana said, and had a ball! 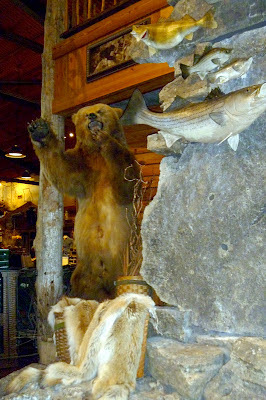 We decided to branch out a bit this month since the weather was good, and met at the huge Bass Pro Shops in Independence. This is right inside the front door, beside a huge fireplace, soft couches, bookcases, piles of decoys and all kinds of fun things. Here's my spread done on the soft lovely couches overlooking the lake...loved the driftwood table! I was having a bear day! I sat beside the indoor pool with real ducks and fish swimming by and sketched this lifelike grizz while people stopped to see what we were doing. Vicky sketched the same bear from a different angle. Vicky had to sketch the Texas longhorn, since all her kids live in Texas! 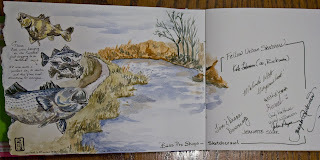 More on my sketchathon on our parent blog, Urban Sketchers. Often the best way to paint an object is not to paint it all but rather paint the shadow shapes that define its form, especially the colossal pure-white Cavalia big top. The shapes and their edges, some sharp and some softly diffused( referred to as “lost”), created by cast shadows constantly change as the sun travels its inevitable path across the sky. Cavalia, featuring 60 horses, acrobats and performers in their downtown St. Louis run opens March 22. 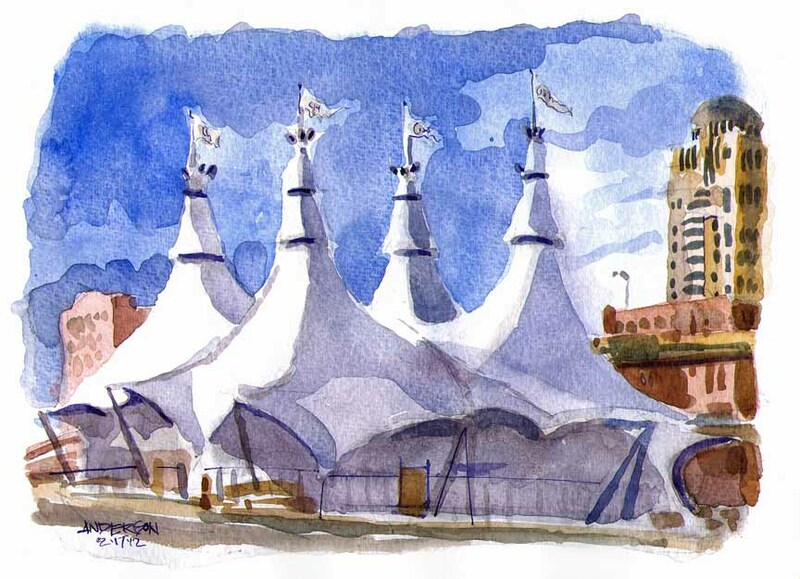 While I don’t have plans to attend the show yet I do want to sketch this visually intriguing structure again. Cavalia Big Top, 02.17.2012(my birthday); Michael Anderson, Conditions: 55F, sunny. On location sketch time: 1 hour. Watercolor, waterbrush on Canson 140lb cold pressed, 7″ h x 9″ w.
We thought Joseph had a doctor's appointment in the City today, so we were up and out much earlier than usual for us...it's NEXT week, so we had lots of time before our lunch date. After a stop by Planter's Seed (yes, again!) 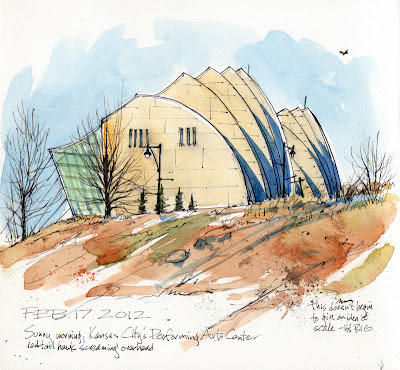 we drove down Main Street and I remembered I'd wanted to sketch the new Kauffman Center for the Performing Arts--what better time! 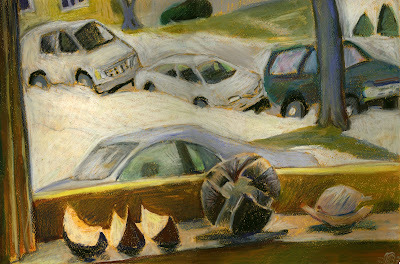 It was glorious weather for it...we found a parking spot just over the hill, and I sketched to my heart's content. After lunch at the Marrakech Cafe (sketches from there once I finish the lettering, but that may be Sunday! ), we hit Costco on the way home...I waited while Joseph ran in and got the few things we needed, so I knew I didn't have much time. This is a Derwent Blue Grey watercolor pencil with a bit of watercolor wash to liven it up. 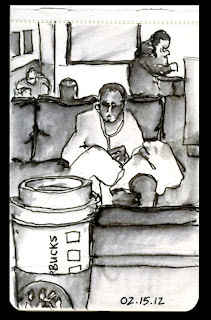 Near where I live, in Chicago, there are five Starbucks in a five block radius. After all the running around I did this weeks, boy am I glad! This was a really quick sketch done with my Lamy Safari pen. I did this for Urban Sketchers Weekly Theme: Insects. I've lived in the same big, old house for 25 years. The big means that there are endless places to stash things. Like the over 10-year-old, junior high school biology project done by my now 24-year-old daughter, found in the basement. The insects, mounted and labeled in a balsa wood/Plexiglas shadow box, were all collected in Cedar Falls, Black Hawk County, Iowa, in autumn, Many of the bugs had disintegrated to dust or fragments. But the remaining were great fun to inspect and draw. The insects, by the way, are not to scale. The tiny green bee on the right was ~5/16". 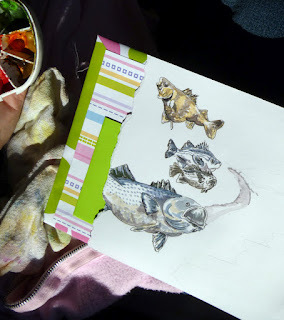 The Grapeleaf, under the smaller magnifier, ~1/2"
I reserve this pocket-size, watercolor Moleskine for nature studies. It is my only sketchbook that I make any attempt at homogeneity. Here and here are earlier drawings in this sketchbook. 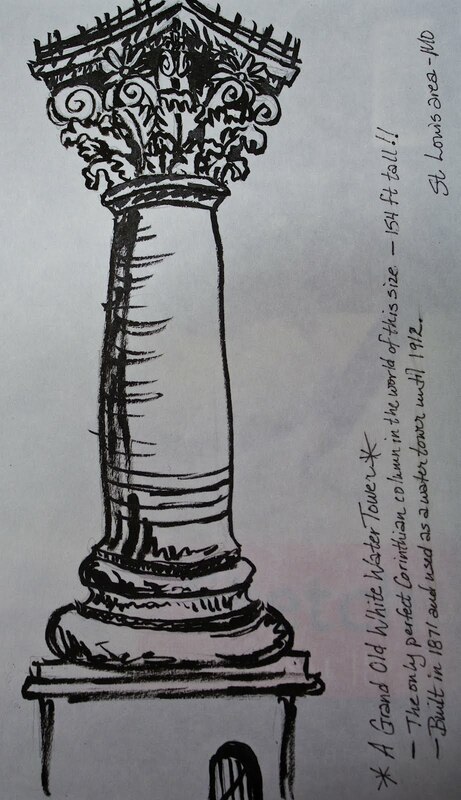 My husband and I were in St. Louis, Missouri on our way back from dragon questing and came across this 154 foot tall Corinthian column. It was built in 1871 and was used as a water tower until 1912. It is said that Charles Lindbergh used the light from the beacon on top to navigate his way home when lost in a Mississippi fog. It was such a curious thing to come across that we had to stop so I could get a quick sketch of it. I rendered it in pencil and then added the ink at home from memory. … at least that's how it is in Chicago in the winter. It's been a warm winter here. I don't think we've been below 0° once this season. Gray days are another story! 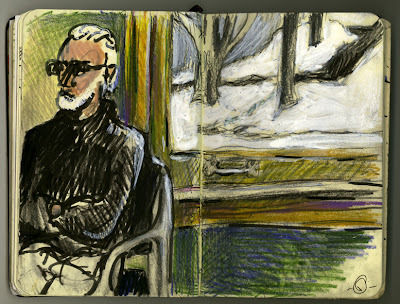 Today five of us met at the Lincoln Park Conservatory to sketch. The Orchid Room captured me right away. Beautiful color and grace in the drab of winter. I tried not to use my pencil but when all was said and done I missed making marks and lines. I may do this again with more line work. (63) running errrands, a photo by vickylw on Flickr. 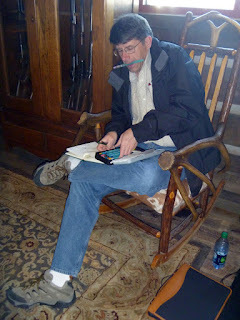 Bill took a personal day Friday and we ran errands for his current woodworking projects. I sketched a bit here and there from the car at the various places --- no planning or thought went into this spread. I had planned on adding the industrial area behind the sign, but two trucks drove up and blocked my view completely. Winter has finally arrived in a serious way. Very cold and blustery out there. Which made the green sprigs of grass popping up behind the gas meter seem totally out of place. 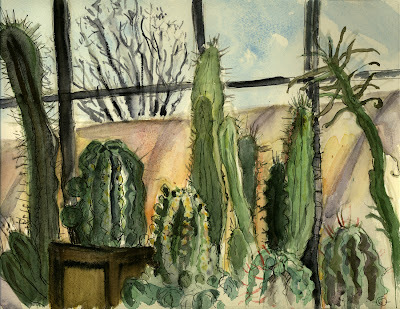 In winter, by necessity, I draw from inside, looking out. It's an opportunity to have a landscape and a still life in one image. 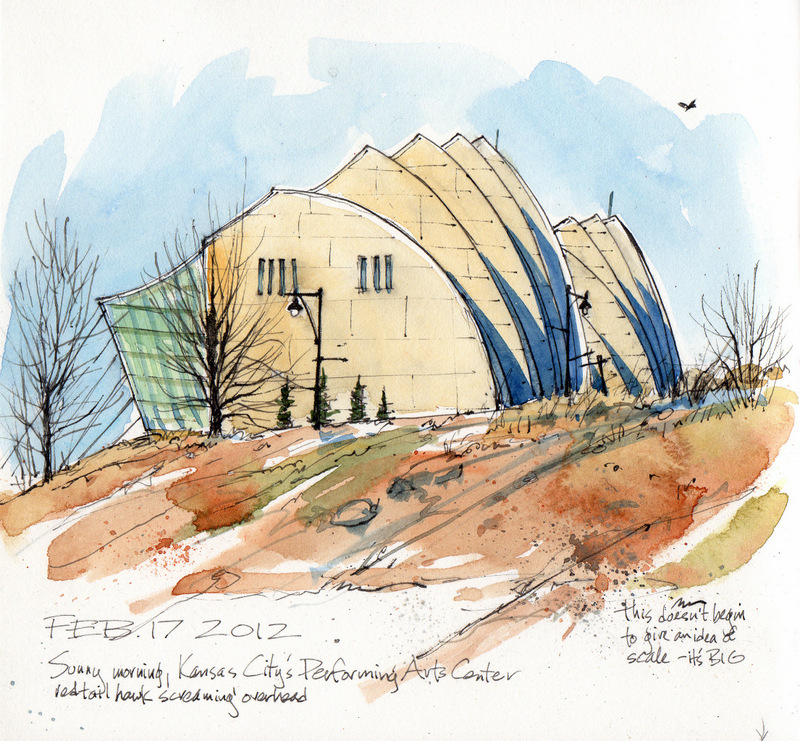 All three of these drawings were done here in Cedar Falls, Iowa, since the start of 2012. I drew this today. On the sill of our kitchen window, my husband is keeping a few of the shellbark hickory nuts he picked up in the fall. Outside, parked cars and snow. In January, from inside the University of Northern Iowa greenhouse, looking out to a leafless tree. From our second floor bedroom window, looking out to the trees and snow across the street. My husband was having a hard day (aka cabin fever). In this case, a landscape and portrait combined. Drew this sketch last September on one of the Saturday sketchcrawls. 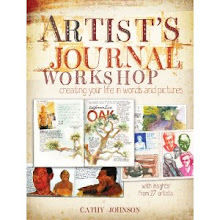 I was surprised and honored to see a photo of this in my sketchbook at the top of this blog. We were in historic downtown Excelsior Springs, MO and it was a rainy & gray day so we sat inside the front windows of Ventana Gourmet Grill. 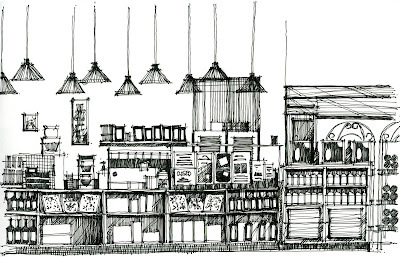 From where I sat I decided to draw the counter area along the back wall of the restaurant. It was a great place to draw and their food is not so bad either. The company of Kate, Joseph, Vicky & Bill made it a great afternoon. Had more rural urban sketching today. Wilma needed a quilting supply run to a small town southwest of here. Burlingame, Kansas. Population: 1017. I decided to tag along and get some sketching time. Some of these small communities have succeeded in making little havens, while others are wilting away. Burlingame has a neat little down town area with parking in the middle of the street. They have a satellite Allen County Community College campus (a few buildings). We ate at Aunt B's restaurant where they make about everything from scratch. Noodler's Ahab flex-nib with Noodler's Lexington Gray. Then watercolor pencils and waterbrush. Velin Arches text woven. It was three years ago today that Holy Name Cathedral in Chicago almost burned down, again. The Cathedral is entwined with the history of the city from gangster murders to papal visits. 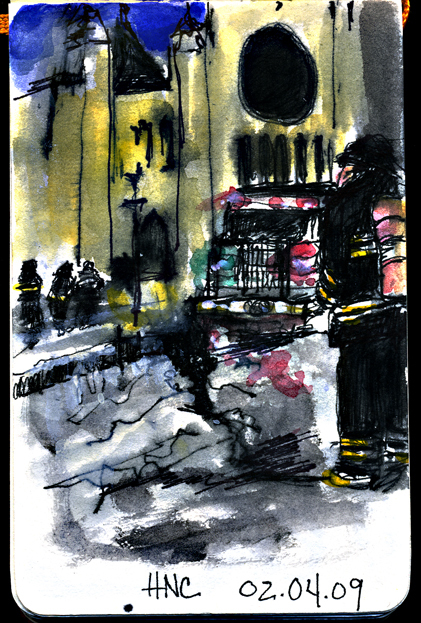 If it wasn't for the brave firemen, the first responders, who answered the call early that morning, the Cathedral would have been leveled to the ground just as it was in the Great Chicago Fire of 1871. They say they were just doing their job-in my book that makes them heroes not just on February 4, 2009 but everyday. This sketch is a little (?) chaotic but that reflects the scene. It was dark, bitter cold and chaotic. 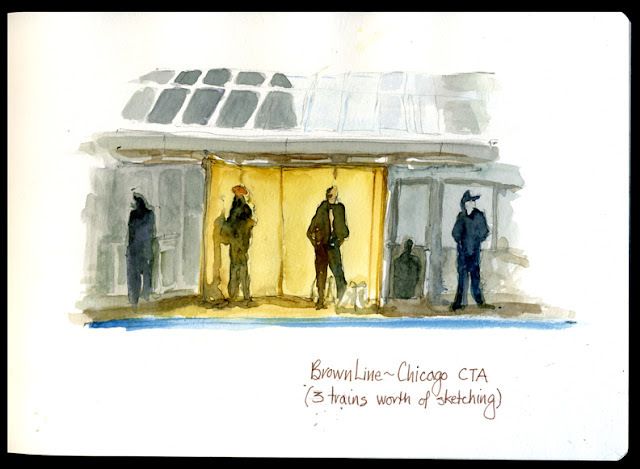 How can I participate Urban Sketchers Midwest? 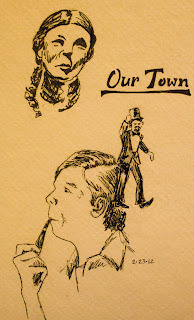 The mission of Urban Sketchers Midwest is to connect on-location sketchers across the state–and like the original International blog, Urban Sketchers, our focus is on sketching on the spot, in cities, towns, and urban nature. “Urban” doesn’t have to mean a big city, nor do you have to focus entirely on architecture. Cars, trains, cafes, shops, people, playgrounds, travel, urban decay, urban nature, reportage drawing, documenting the changes where you live...it all works. Show us YOUR Midwest. 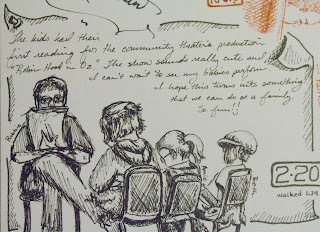 The Urban Sketchers Midwest blog is by invitation only, but we encourage you to participate in Urban Sketchers Midwest through sketchcrawls, meet-ups, events, and eventually perhaps even workshops. The Flickr and Facebook groups are open to everyone. The only "requirement" for posting on those pages is that the urban sketches be done on location, from direct observation. Beginners are welcome and encouraged, so please jump in! Correspondents come from all over the Midwest, and have diverse backgrounds, from painting, architecture, journalism, engineering, advertising, illustration, graphic design, teaching and more. All of them share the same passion for drawing on location. Being a correspondent means a strong involvement in our community of sketchers, including posting to the blog regularly —a minimum of once a month— and offering feedback to fellow sketchers on the blog, Flickr, and Facebook page. 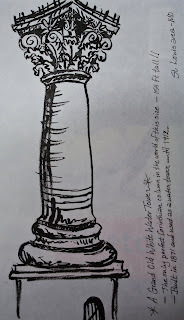 Correspondents not only add individual drawings to the blog but also narrative explaining the circumstances in which the sketch was done or a particular story behind it. To attend local outings when possible and to organize them in your own area, if desired. 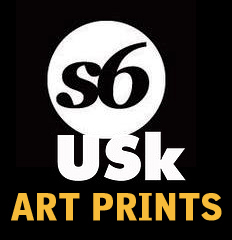 It is also suggested that anyone interested in becoming a USk Midwest correspondent apply for membership in the global USk organization. Thank you for your interest! Can’t wait to see your sketches.